Future possibilities for pilgrimages to Russia taking place in 2019 are being discussed with my colleagues. We hope to provide a deeply spiritual journey where we will visit and observe monastery life, rural church and parish life, restorative iconography projects and techniques, and be able to spend ample time visiting the popular cultural and spiritual sites of Moscow and St. Petersburg. Please contact me to express your potential interest. In contemplating another journey to Russia, allow me share with you beautiful words of Elder Paisios of Mount Athos. This painting is the work of my friend and colleague in St. Petersburg, renowned artist, Vasily Bratanyuk who demonstrates the love of church, his Holy Fathers, his faith in his oil paintings. 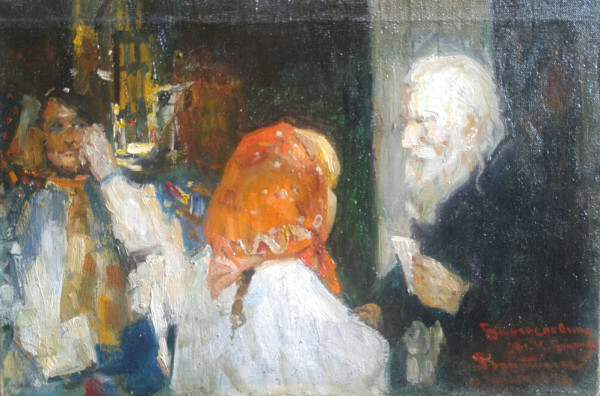 During his travels to Greece he painted this image of Matushka Elizabeth Lechtenberskaya and Elder Paisios in 1993. Christ from on high sees how each one of us acts, and knows how and when to act for our benefit. He knows how and where to guide us, as long as we ask for His help, tell Him our desires and allow Him to put things in order.